With the stark contrast between the whites of the Moon, and the black silhouette of this Fairy – it seems that light and dark Moon Fairies, could not be more different! This Dark Fairy silhouette, matches the shading of the Forest and it’s Trees. What once was calm and friendly, now takes on a new persona – shrouded in the mysteries of the Dark. What was that sound? The Trees creaking in the night, as a flock of startled birds – take to the sky. What startled the birds? The Creeping Willow “on the right”, as your imagination runs amok – “running scared” within this Midnight Wood. But with a flutter of wings did you first notice; the butterflies of light – upon the bottom right. 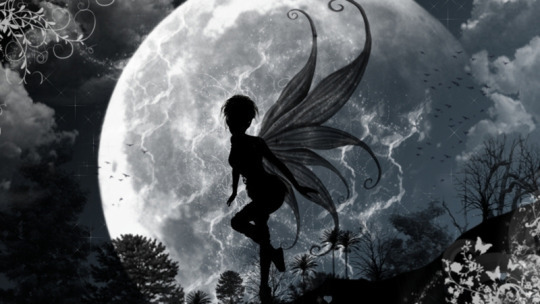 But with a flutter of wings did you then notice; the Fairy in dark – as she appeared in-front of the Moon. Both hiding in the shadows, with just an arc of Moon, thinking of this Moonlit night! How long did you shiver? It felt like an hour, but it could only have been – several minutes at most! For I found myself “lost” in Fairy Glamour. This Fairy was a contradiction! Her silhouette in black, with moonlit Fairy Wings – that reminded me so very-much, of a garden Flower Fairy. It was her petals that shimmered in the light of the Moon. It was her petals that guided me this night – for she helped me to find, a path through these Woods! This entry was posted in Fantasy Fairy Art and tagged butterflies, dark fairy, fairies, fairy, fantasy, full moon, moonlight, night. Bookmark the permalink.